A pet deer has killed a man and seriously injured his wife in a rare attack in Australia, police say. The man, 47, had gone to feed the animal on his property in Victoria when the attack happened on Wednesday. The woman suffered life-threatening injuries after going to her husband’s aid, local media said. She was flown to hospital for treatment. A recent study into all deaths caused by animals in Australia between 2000 and 2013 found none had involved deer. Study author Dr Ronelle Welton told the BBC that she was not aware of any deer attacks featuring in Australian coroner’s records. 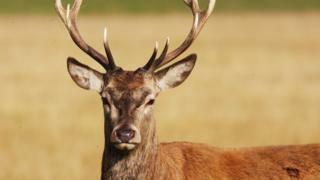 Police said they had euthanised the deer at the scene near Wangaratta, about 250km (155 miles) north-east of Melbourne. Local media said that the injured woman was helped from the deer’s pen by her teenage son. The family had had the animal for about six years, it was reported. Authorities did not identify the species of deer. Sambar, fallow, red and hog deer are all found in Victoria. In recent times, state authorities have warned that numbers of feral deer have increased to more than one million. A government report last year noted that wild deer had been responsible for road collisions and infrastructure damage. “Deer sightings and reports of public safety risk are becoming more common,” the report said. Parks Victoria classifies deer – which are not native to Australia – as a threat to vegetation in national parks.